LG.SP | NA Regiment: Recruiting! More information will be posted as it comes and this thread will evolve with our regiment. See you on the battlefield. Re: Leib Gvardii Semyonovskii Polk | LG.SP | NA+EU Regiment: Recruiting! First time making a forum post like this. Please give suggestions! The regiment will officially launch when the melee update is dropped, so as to better take advantage of the improved combat mechanics. We're on hold until then. Thanks for the suggestion! I'll check that out. We've decided to launch early, and are now actively recruiting and signing up for events. God save the Tsar! Had some great events so far with the KRA and the IR NO.8. Appreciate the support everyone is giving us! Had a great event with the Nr9 yesterday, earned our regiment plenty of glory fighting against greater odds. Thanks for having us! Haven't seen a Russian regiment in this game yet for NA, then again I haven't played in 8 months. Good luck! Yup. When Russia comes out, we'll be ready. In the meantime, though, we've been recruiting both EU and NA fellows and have events for both timezones. 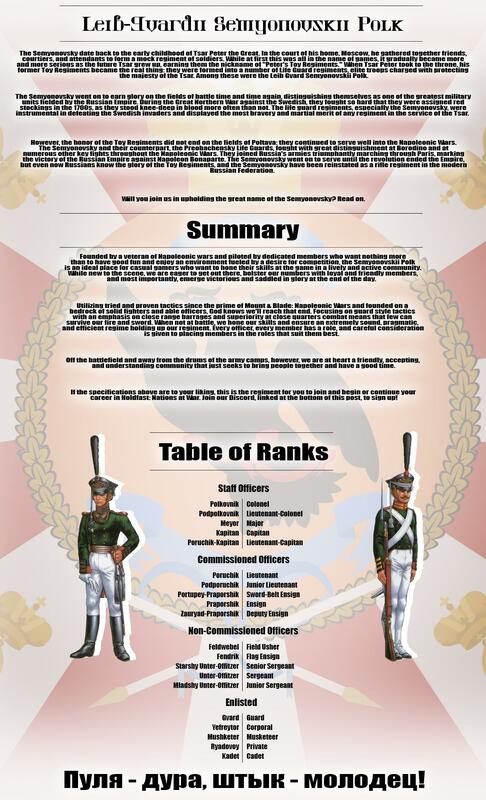 We've officially reached 50 members of the regiment! Had some great 1v1s with the 25FK today. The score turned out 2-4 25FK, but as our first ever 1v1, I'm proud of our results nonetheless. Looking to get involved in some 1v1s!